and facing yet more misery with their hair loss. So after extensive research and development Brummells is proud to introduce NSMT. 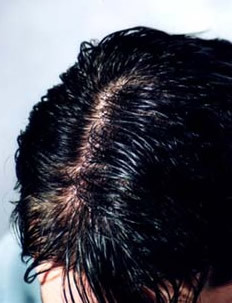 Non Surgical Micro Technology is the only guaranteed form of hair replacement on the market today. The results are outstanding and only available at Brummells. If you do not have Non Surgical Micro Technology hair systems you are seriously compromising your image. The method used is non surgical and painless. No drugs are involved and, unlike surgery, it is reversible and fully guaranteed. It is 24 hour a day hair replacement and you will be able to continue participating in your outdoor pursuits with total confidence. In fact, it will probably enable you to do certain activities that you may have stopped. The procedure involves using as much of your own hair as possible and thickening up the thinner area. The thickening the hair is attached to a super fine- membrane, which a professional stylist will attach and blend into your own hair. This is an integral point, you can have the best hair system but if the stylist is not cutting and styling correctly then you will still not have that look you desire. Brummells Hair Stylists are highly trained and qualified to give you the finished look that you want. At home, you treat the hair as if it were your own naturally growing hair- you shampoo, condition and brush it as normal. You can gel, mousse or wax it if you desire. You will need to pop back to the salon every 6 to 8 weeks to keep your hair trim and looking great. If however you can not Brummells offers a full back up service where we can help you maintain your new hair yourself. Brummells as an organisation does not believe in any hard pressure selling, we are more than happy to look after clients hair programmes/systems which were not initially purchased from us. We pride ourselves on our aftercare services, we welcome you to come and see for yourself.